Addressing the participants of the festive event, the head of state pointed out that Kazakhstan passing over a landmark of the development of its national statehood and celebrating the 15th Anniversary of the Highest Law of the country. “The Constitution consolidated the unity of the people and citizens of all ethnic groups bounded by common historical fate. It became the creative basis for the country’s development. During these years we have made a tremendous advance in building Kazakhstan as a modern state,” Nursultan Nazarbayev stated. The President emphasized that all achievements and values are under the solid protection of Kazakhstan’s Army, an heiress of the great military traditions of our country. “I appeal for those who guards our Independence. The great mission to protect the sovereignty of Kazakhstan and keep the tranquility of all Kazakhstanis lies on you,” the head of state stressed. 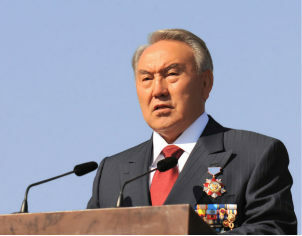 The President congratulated all Kazakhstanis on the holiday. The performance of young drummers from the Zhas Ulan Republican School named after the Hero of the Soviet Union Sagadat Nurmagambetov opened the festive parade. The military detachments from the Land Forces, the Air Forces, and the Navy of Kazakhstan as well as the detachments of the Ministry of Defence, the National Security Committee, the Ministry of Emergency and the Republican Guard – almost 2, 000 officers and conscript soldiers marched before the gathering during a military parade. Women soldiers took part in the military parade for the first time. They are on a par with the men serve their duty to protect the Motherland. More than 150 units of military vehicles and 66 aircraft took part in the parade.